Mi banda, Iosl Wakstein Klezmer Band, Buenos Aires, Argentina, se compone de trompeta, clarinete, trombon, tuba, bateria, bombardino y en su version big duplico algunos de dichos instrumentos. E-mail Iosl Wakstein. Currently based in Syracuse, New York, "The Wandering Klezmorim" is a versatile group that plays in the klezmer traditions from Eastern Europe, the Lower East Side, and the Middle East. Ken Frieden (Bb and C clarinets) founded this group in Atlanta, Georgia in 1991. Since then, it has performed concerts and celebrations in Europe, Israel, and in the Northeast. We specialize in renditions of Naftule Brandwein's pieces from the 1920s; our repertoire also includes original compositions such as Frieden's "Wedding Dance." In addition to playing for many private celebrations in Central New York, "The Wandering Klezmorim" performed at Cornell University in Summer 1999 and at Syracuse University in September 2000. Tel: (315) 443-1894. Web: wanderingklezmorim.syr.edu. E-mail Wandering Klezmorim. (Ken Frieden). Warm Purple Gefilte hail from a Galaxy just west of Andromeda, near the small joint that serves great chocolate egg creams. They play a music that has physical substance and envelopes the audience in a warm purple musical ooze reminiscent of the jelly used to can gefilte fish. The Mark Weinstein/Jewish Jazz Ensemble, based in Glen Ridge, NJ, consists of world class jazz musicians who draw upon klezmer, sephardic, synagoge and 2nd Avenue favorites to create a fresh and deeply moving fusion that strikes a perfect balance between virtuoso improvization and traditional roots. 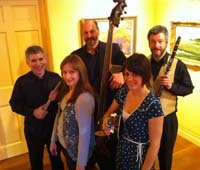 Mark Weinstein, flute, Mike Richmond, bass, Brad Shepik, guitar and Jamie Haddad percussion. Contact: LKC Productions, 41 Clinton Road, Glen Ridge, NJ 07028. Tel: 973 429 0259. Web: www.jazzfluteweinstein.com. E-mail Mark Weinstein. The Westfriese KLZMR banD is a Dutch band, living in West-Friesland (The Netherlands), which is a part of Holland, located one hour riding (by car or train) North of Amsterdam. So we named our band as many others (Chicago Klezmer Ensemble/ Maxwell Street) with the name of our region. We omitted the e in the word klezmer to make it more related to the Yiddish. Musicians and instruments: Cor van Sliedregt - tsimbl, guitar, business director; Danielle Janssen - double bass, puk; Jan Sijben - trombone, tuba, tenor-banjo, darabuka; Paul Hondius - saxophone, clarinet, guitar; Rico Linders - Bb-clarinet, bass-clarinet, Ab-clarinet, mandolin; Kees Rood - accordion. We play in the traditional style, focused on the European and early American Styles. We are all goy with interest and respect for the Jewish culture. We started in 1997 and played for concerts and weddings etc. Cor van Sliedregt wrote a little wordbook with all the klezmer terms; and compiled a discography of klezmer LP's, MC's and CD's. He gives also lectures obout the history of klezmer. E-mail Westfriese KLZMR banD. (Cornelis van Sliedregt). What the Chelm has been one of the hardest bands to track online. Everything keeps moving. From their CD: "[we] began in 1992 when four people got together to play a couple of tunes at a hannuka party. [We have] grown into an amazingly diverse group of musicians, ranging in age from teenager to "you shouldn't ask." As in traditional Jewish folk bands, most of the members have other trades--WTC's ranks include a woodworker, a lawyer, several students, a professor, a nurse practitioner, a librarian, a rabbi, a weatherperson, and (most handily) a chef/recording engineer. And no, we are not even all Jewish. What we do have in common is a love for the broad spectrum of Jewish music and the joy of sharing it with others in our own Chelm-like way. Web: www.whatthechelm.com. Send E-mail. (Louis Lippman). Since 1982, Wholesale Klezmer performed both in the traditional context of providing music and dance leadership for Jewish weddings and other simkhes, on the concert stage, and at school and college educational programs. Their repertoire includes music for dance, traditional Yiddish folk songs, and Yiddish theater and vaudeville songs, including original compositions. The Wholesale Klezmer Band performs in Yiddish and Loshn Koydesh, (Ashkenazic Hebrew), and they specialize in making it accessible to the English speaking world with translations, stories, explanations, visual aids, and that universal language that speaks to your feet and makes them want to dance. They write many of their own dance tunes and Yiddish songs that speak to contemporary concerns. Among their recent albums are "Prayer for a broken world", "Yidn fun amol" and Sing for Peace, Dance for Joy (2002). Web: www.wholesaleklezmer.com. E-mail Wholesale Klezmer.